A weather report on what the effects of Hurricane Florence might look like has gone viral for its dramatic use of a green screen. 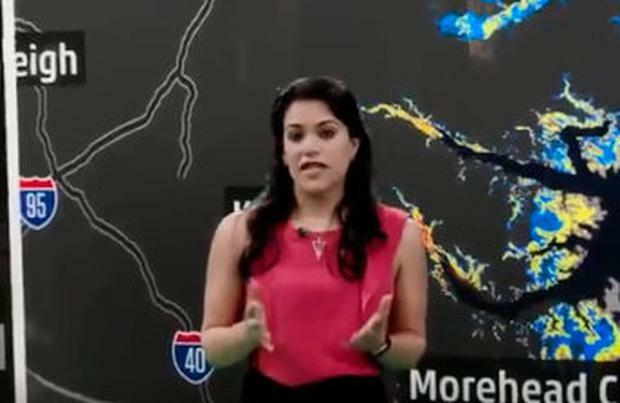 Meteorologist Erika Navarro delivered the report for The Weather Channel online, demonstrating the "life-threatening" possible aftermath of Hurricane Florence when it hits the Carolina coast. Standing on a round pod surrounded by a green screen, the meteorologists use the background screen to immerse Ms Navarro in water, starting at her shins and working it's way up. "This could be enough to knock you off your feet," Ms Navarro says. As the water reaches the 6ft mark on the screen, Ms Navarro explains how she would no longer be able to stand- and when it reaches 9ft, she describes the "life-threatening" effects. "This water is through the first floor of your home, into the second and you can see there's fish floating around in here, this is an extremely threatening and life-threatening situation." The video has received a mixed reaction online, with some calling it "scaremongering". "Scary as f**k weather report. First it's like, ah smart use of green screen, then it's like holy f**king sh*t," one user said. "Nobody does news like the US. They scaremonger their audience perfectly to continue tuning in to learn more about the horrors that face them, sponsored by Bud Light...," said another. "Also in times of natural disasters, it’s better to be conservative and assume the worst scenarios then hedge that things get better."